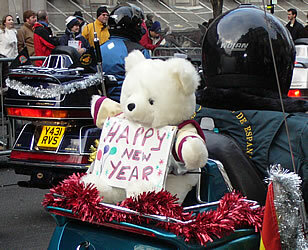 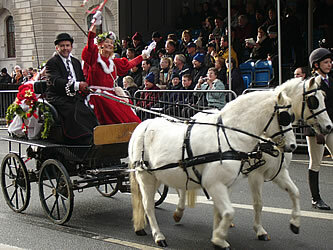 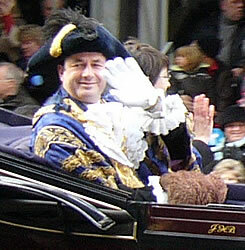 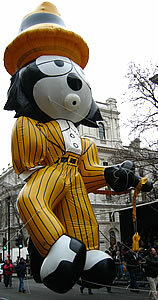 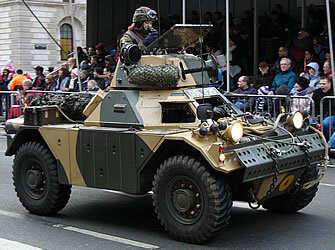 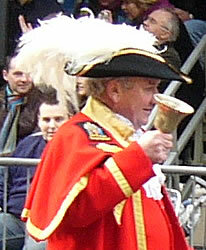 The New Year's Parade is a free event which has taken place in London each New Year's Day since 1987. 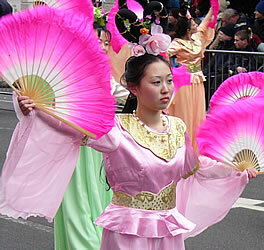 More than 10,000 performers take part: it takes about 2 hours for the full parade to pass by. 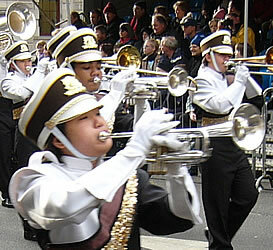 There are marching bands and cheerleaders: many of these travel from the US to take part. 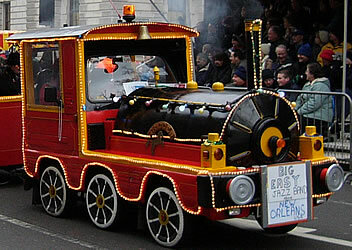 There are also historic vehicles, animals, clowns and giant balloons, and floats representing different boroughs in London. 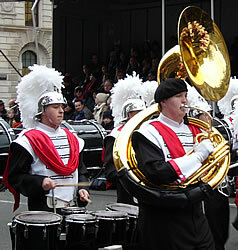 Many thousands of people line the 2-mile route of the procession. 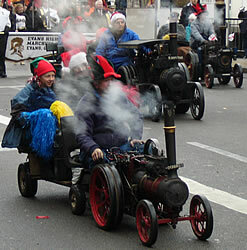 Collectors along the route accept voluntary donations, raising money for various charities. 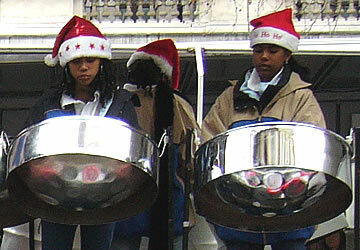 This event takes place each year on 1 January, starting at about 12 noon. 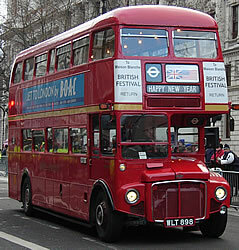 The usual route is: Piccadilly (near Green Park Tube station), Piccadilly Circus (near Piccadilly Circus Tube station), Lower Regent Street, Waterloo Place, Pall Mall, Cockspur Street, Trafalgar Square (near Charing Cross Tube station), Whitehall, Parliament Street (near Westminster Tube station). 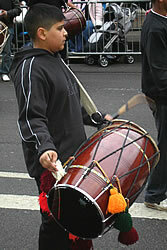 The photos below were taken at the 2006 event. 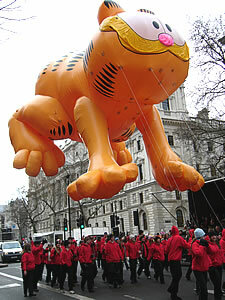 Welcome to the New Year's Day Parade! 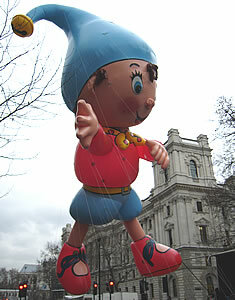 The giant inflatables ranged from Noddy to Buddy. 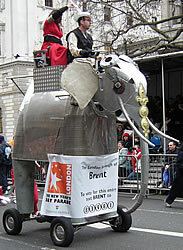 Fortunately it was not a windy day, but great skill was required to avoid the trees along the route! 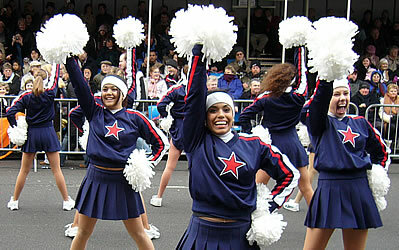 Among the cheerleaders which performed were three American teams: the UCA (Universal Cheerleaders Associan), UDA (Universal Dance Association) and USA (United Spirit Association). 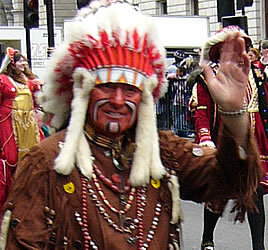 There was also a performance by the BCA (British Cheerleading Association). 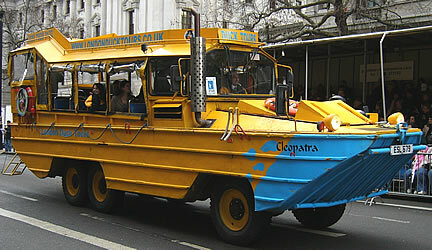 Many different forms of transport are used. 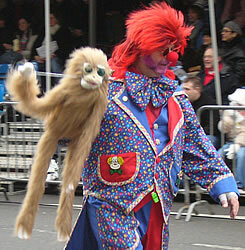 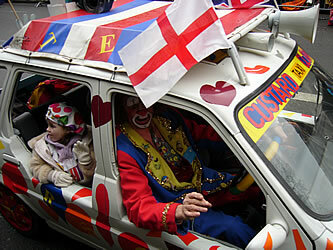 Members of Clowns International joined the procession. 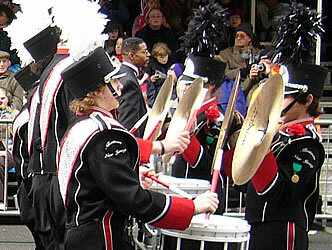 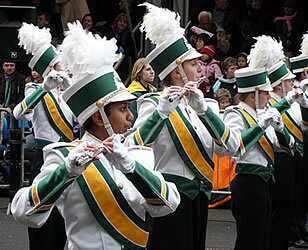 Music was provided by many marching bands from US high schools and universities. 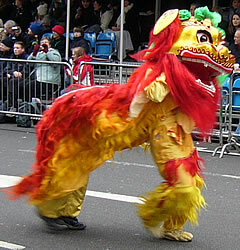 Many different cultures are represented in the parade. 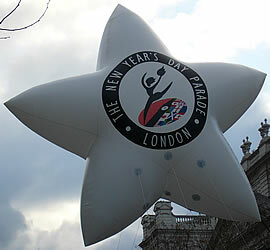 For more information about the New Year's Day Parade (including merchandise), see the event's official website: http://www.londonparade.co.uk.